Window Automation Market size is set to exceed USD 8 billion by 2024; according to a new research report by Global Market Insights, Inc. Window automation market is expected to grow over the forecast timespan due to the increasing energy savings and reduced operational costs with the implementation of these systems. Automated windows can control & detect air and light requirements and adjust their operations accordingly, thus saving energy considerably. Furthermore, climate control using natural ventilation requires expensive mechanical controls such as in air conditioners. The performance of windows is based on the SGHC rating that defines the amount of solar energy striking the window and the U-factor that defines the rate of heat transfer per unit and the unit temperature difference. Automated systems with low U-factor provide significant annual energy savings in the residential sector, thus propelling the window automation market growth. For instance, switching to these solutions in the U.S. can help households reduce the energy bill to approximately USD 150 in warm climates and to USD 277 in cold climates. Growing trend of solar-powered systems is expected to propel the window automation market growth. The increasing use of solar-powered battery-operated systems provides environmentally-friendly alternatives to these solutions. Furthermore, solar-powered systems reduce the complexities pertaining to wiring and are easy to install. These also can be fitted with additional functionalities such as rain sensors, propelling the demand for solar-powered systems. Lack of awareness and non-compliance with regulatory standards are expected to hinder the window automation market growth. Most of the buildings stick to the retrofit mechanical and electrically-operated systems. Also, the high costs of implementation of these systems in old buildings are discouraging the building managers to comply with the standards pertaining to the implementation of these systems. The mechanical window automation market is anticipated to grow at a above 6.5% growth from 2018 to 2024 due to its widespread use in the retail sector and warehouses. These are typically used in applications where windows are hard to reach and at high levels. These are also widely used in applications such as government buildings and schools, where electrical systems are risky and costly to implement. With the advent of advanced technology, the window automation market is characterized by increasing demand for sensors and detectors which expected to be valued over USD 950 million by 2024. Increased requirements for safety and security are propelling the manufacturers to implement sensors for the detection of intruders and smoke & harmful gases. Furthermore, these components are used in residential applications to keep a check on pollutants such as pollen, soot, and dust. The integration of these components with sensors that perform advanced features, such as rain detection, is expected to propel the demand for these components. The industrial window automation market was approximately USD 540 million in 2017. The increasing use in manufacturing facilities, cold storages, warehouses, showrooms, and data centers is expected to fuel the demand for these solutions over the future. Growing need for comfort, efficiency, and low energy consumption will drive the demand in industrial applications. Furthermore, the installation of these systems is very common in chemicals & pharmaceutical sectors due to the increasing need for ventilation. 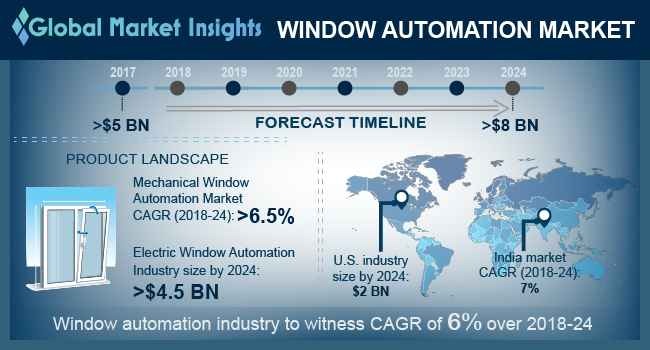 India window automation market is expected to witness significant growth nearly 7% from 2018 to 2024 due to increasing infrastructural projects and implementation of advanced technologies in these projects. The government is undertaking several projects such as Digital India and smart cities that focus on implementation of technology. Increasing awareness regarding technology and rising disposable income of the people that encourage them to implement these solutions will increase the demand for these solutions. Key players in the window automation market include Kintrol, Insteon, Geze GmbH, Aumuller, Ultraflex Group, and Vent Engineering. The manufacturers are focused on developing customized solutions catering to specific industry requirements. These companies are heavily investing in R&D to develop solutions that can be integrated with smart homes.